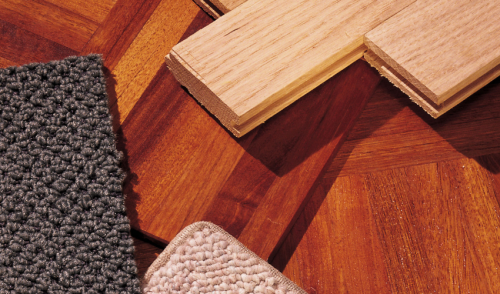 The flooring market is being transformed as consumer preferences migrate toward better-quality, higher-priced goods. Driven in large part by recent innovations—wood-plastic composites (WPC), rigid core luxury vinyl, pet protection, soft carpet, and more—plus technological advancements like high-definition printing and constantly changing design trends, flooring is garnering more attention than ever. All of those forces of change come together in flooring’s fastest growing category: luxury vinyl. Previously, LVT/P (luxury vinyl tile/planks) found wide acceptance until WPC came along with improvements in both performance and design. As a result, WPC is the fastest-growing luxury vinyl product being sold today. But a new competitor has joined the fray: rigid core. These products are starting to work their way into the market and offer a decided price advantage over WPC and performance that beats out traditional LVT. The big news, then, in luxury vinyl is the explosion of formats. Suddenly there are so many options in this burgeoning category that consumers can’t help but take notice. Embossed-in-register design capabilities, strong visuals, and waterproof features are winning over end-users. Improved and more flexible installation options also have helped fuel growth. Finally, a wide range of price points is helping drive demand even further. WPC has taken the lead, primarily because it is waterproof, but also because of superior visuals and improvements in dimensional stability and dent resistance. As such, it is the costliest of the three luxury vinyl products, but arguably the best in terms of balancing style and design attributes and performance. The move toward rigid core products comes primarily to underprice existing WPC offerings but is also due to a range of improvements—enhanced visuals over LVT/P and the best dent resistance of the category. Still an upgrade over LVT but generally priced below WPC, rigid core’s ability to overcome subfloor telegraphing and enhanced visuals are helping this newcomer get out of the gate fast. “Time will tell if rigid core products start taking market from WPC,” says Bob Dolan, director of hardwood, laminate for Avalon Flooring, one of the nation’s top 100 flooring retailers. Where he expects to see more of a market share shift is across luxury vinyl tile and plank. “Builder is really the one place where traditional click LVT still had a place, although that’s probably in jeopardy to rigid core as they bring out lower price points,” he says. That fast growth of luxury vinyl products may be felt most acutely in laminate. Alabama’s largest chain of flooring stores in the state no longer installs laminate, as it has dropped to a very small percentage of sales (mostly DIY). Manufacturers are hoping to stave off this sales decline by tackling what has been laminate’s weakness: moisture. New warrantied spill-resistant features and edge treatments may give it a fighting chance against LVT’s onslaught. “The waterproof element of laminate is not unimportant, but it will not propel laminate back to a significant category, ” says a buyer for a major national retail chain. But there is a new opportunity that suits laminate flooring well: walls. Manufacturers are seizing on this even as retailers agree no one has figured out how to effectively display the product this way. Here, too, laminate’s competitive price point and easy installation make it an affordable, DIY-friendly option. Large-format ceramic—rectangles 12 by 24 inches and larger—continue to dominate sales, aided in part by porcelain’s ability to perform even in these larger formats. Slabs as large as 5 feet are starting to capture attention, especially in signature spaces of the home. The wood look, which has been very strong in ceramic, is not growing as fast as it once was, but is finding new ways to inspire. As a result, we’re seeing a greater use of pattern, both on the actual tiles as well as how they are installed; chevrons and herringbone patterns are increasingly popular. Lower price points are also making it easier to sell the product, she says. Black and white tiles, linear designs, and strong gray influences are all gaining in popularity. And don’t forget subway tiles, which are gaining despite a broader move to larger formats. Stone and marble visuals have also caught on. Here, high-definition printing has allowed for ultra-realistic looks that are virtually indistinguishable from the real thing—at a much lower price point. Porcelain, which has captured a significant share of the tile market, continues to grow, especially with its ability to be used in both indoor and outdoor spaces. With the movement toward al fresco living, expect continued growth in the use of outdoor tile and pavers. Hardwood Remains Strong. Carpet? Not So Much. Hardwood is feeling the heat from increased competition as virtually every other flooring category tries to emulate its natural look. However, longer, wider engineered boards with striking visuals and surface finishes are keeping hardwood top of mind. Larger boards don’t necessarily work in every setting and can significantly drive up costs. But, Dolan says, the sweet spot has settled in at 5- to 7.5-inch widths with traditional lengths of 4 to 5 feet and 6 to 7 feet for longer boards, all at around $10 a square foot and lower. Hand-scraped looks (somewhat in decline), and oil and wire brushed finishes that bring out the natural wood grain especially appeal to today’s buyers, who prefer more “character” in their hardwood floors. Gray undertones are also growing in popularity, giving today’s hardwood floors a more contemporary feel.